Riviera Nayarit Mexico Blog: ¡The Pescado Zarandeado Is A Must In The Riviera Nayarit! 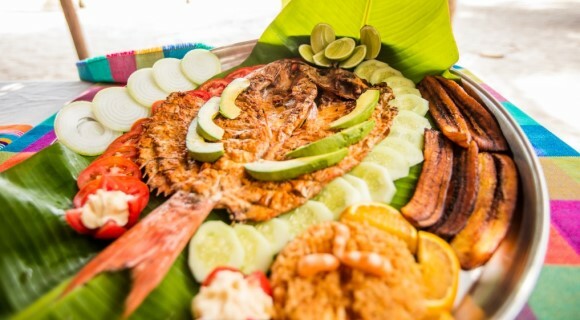 ¡The Pescado Zarandeado Is A Must In The Riviera Nayarit! What in the world is a pescado zarandeado? It’s actually one of the signature seafood dishes of the Riviera Nayarit! Today we’ll learn a bit about its history, how to make it and why it’s so very delicious—all with the help of the Riviera Nayarit’s Culinary Ambassador, Chef Betty Vázquez. As it burned, that charcoal gave off a particular kind of smoke, which slowly permeated the butterflied fish fillets that were seasoned only with salt. That was the original zarandeado! As time went by, newer and just as delicious recipes came into play, including adding seasonings made with regional chiles such as the Cora and the Guajillo. Chef Betty, however, prefers not to add any seasoning, citing her love for the “natural flavors” of the fish. This delicious dish has no doubt become very popular throughout the region. Truth is, its origins are a bit inexact, but it’s believed to originate with the nomadic tribes when they began to settle down and found in this area of the Pacific a bounty of provisions. The other issue—similar to that of the popular Aguachile—is the dispute over the original recipe between the states of Nayarit and Sinaloa. So we turned once again to our specialist, who said: “In those days there were no territorial borders to cross, only the limits imposed by the land and the water… How are we supposed to define who was first, Sinaloa or Nayarit? Whatever its origins, the truth is there’s nothing like a delicious Pescado Zarandeado, a classic of Mexican cooking and a dish that challenges both foodies and the most sophisticated gourmands to enjoy it without licking their fingers… We know: it’s impossible!